The start of Hendri’s photographic career dates back to his pre-school days when he revealed an obsession to press every button he could find, whether on a TV, VCR, Soundboard, slide projector, camera or car. This is probably what lured him into his father’s darkroom at night where he would sit and watch photographs being developed in trays filled with chemicals. Some 20 years later he is still pressing buttons as a full time photographer and tutor of other photographers, hobbyists and enthusiasts. Growing up with 2 parents dedicated to their full time photography, Hendri’s every school holiday was designed with photography in mind. This gave him opportunities to photograph wildlife and landscapes all over Southern Africa. It certainly sparked his love for Africa and all of its inhabitants. These entities are still his greatest passion behind the lens. During his high school years his passion for wildlife photography naturally progressed to sports photography at school events and became his first stream of income some 15 years ago. The early start, the opportunity to work with top-end professional equipment at a very young age and the fact that his father was an internationally recognized wildlife and portrait photographer serving as his mentor, certainly paved the way for what would be his only career option. In 2002, Hendri started his full-time career as a photographer at the family-owned portrait studios, “The Photographer”, in Pretoria and Sandton City, Johannesburg. “The Photographer” enterprise regards itself as the foremost family portrait studio in South Africa, specializing in traditional canvass portraits for clients from Musina to Cape Town, as well as exporting to international clients all over the world. Consequently the Sandton studio practices the highest levels of professional photography. In 2004 Hendri, together with his father Lou, started what is today known as the “Nikon School of Photography”. The concept was born from the realization that digital cameras are not always as easy to operate, as salesmen would like one to believe. Over the next five years Hendri trained in excess of 5 000 Nikon users on how to operate their camera, its hardware and software, as well as offering various photographic courses ranging from wildlife, landscape, sports, portrait and wedding photography. In 2009, Hendri joined Nikon SA as NPS (Nikon Professional Services) Manager, being the youngest in the world to hold this position. NPS is an international support program operated by Nikon to cater for full-time photographers using Nikon equipment in many different countries. This entails all technical support on hard and software matters, as well as support for special photographic projects and all major sporting events where photographers are present. 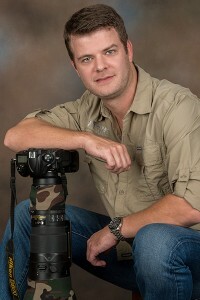 In 2010 Hendri, together with Lou, launched CNP (Coetzer Nature Photography). CNP is a specialist wildlife photographic safari operator catering for the needs of professionals, hobbyists and corporate clients. With 2 specifically designed photography boats operating on the Chobe River in Botswana and 2 safari vehicles operating in Namibia, Botswana and Tanzania, all fully equipped with professional photographic equipment, CNP has quickly become a world leader in terms of innovation for wildlife photography. Importantly, CNP’s results are measured by our clients’ photographic achievements.